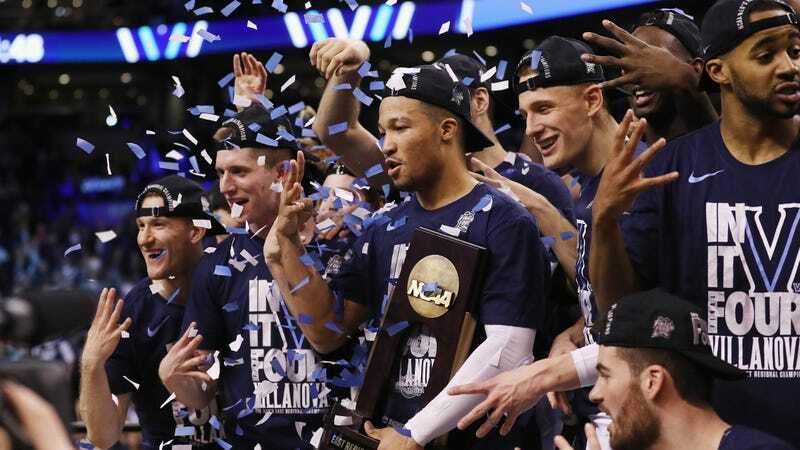 Villanova used balanced scoring and a flat-out unfair advantage on the boards to cruise past third seed Texas Tech, 71-59, and advance to their second Final Four in three years, and third trip during head coach Jay Wright’s tenure. Texas Tech jumped out to a 9-1 lead in the opening minutes, but Villanova drew even by the 13 minute mark of the first half, and were firmly in control by halftime. I am drawn to the following stat, which strikes me as absolutely ridiculous, and perhaps describes, more than anything else, the shape of this game: Texas Tech, starting four guards, secured 33 total rebounds in the game, while Villanova yanked down a season-high 20 offensive rebounds, and 51 total boards. The Wildcats, as prolific a three-bombing college team as you will ever see, hit just a 4-of-24 from beyond the arc, and connected on just 33 percent of their field goal attempts in the game, but got to the line for 35 free throws; owing to all those offensive rebounds, Villanova attempted 92 shots plus free throws in the game, to just 78 for Texas Tech. That is a hell of a disadvantage for a team to overcome, and not necessarily one you’d expect to befall the Red Raiders, four-guard lineup notwithstanding: Texas Tech finished this season ranked 51st in average rebound margin, at plus-4.2, whereas Villanova finished 83rd, at plus-2.7. That’s a noisy, wildly imperfect metric, but if nothing else it shows the Red Raiders at least know how to hit the defensive glass. Villanova came in ranked 248th in college basketball in total offensive rebounds—another noisy stat, but good enough to know they haven’t exactly been juggernauts in that regard. This was just one of those games where it seemed like one team had an extra player on the court every time one of their shots came off the glass. Texas Tech senior and leading scorer Keenan Evans was held to 12 points on 3-of-14 shooting; he and four other seniors will be leaving Texas Tech in the hands of youngsters like Zhaire Smith and what is considered a reasonably strong recruiting class. Villanova will face the winner of Duke-Kansas in next weekend’s Final Four.